Saltwater, limited space, inclined ground? No sweat. 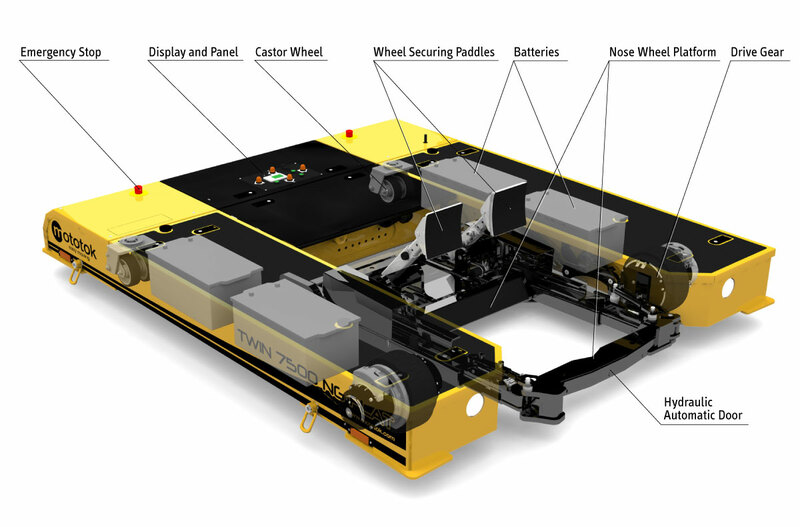 Thanks to watertight, saltwater resistant materials and active 4-wheel-steering, the tug can be used on aircraft carriers without difficulty. High definition lighting allows working both day and night shifts. Offshore, the co-located set up of take-off and landing areas result in an extremely small overall area where your aircraft can operate. 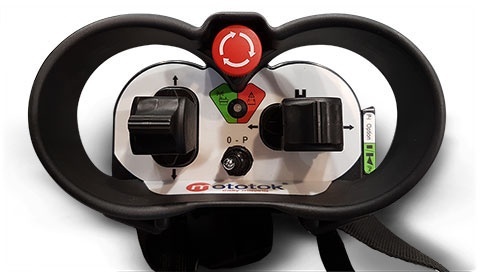 Mototok’s very compact design and its highly precise steering capabilities keep the space required at an absolute minimum. 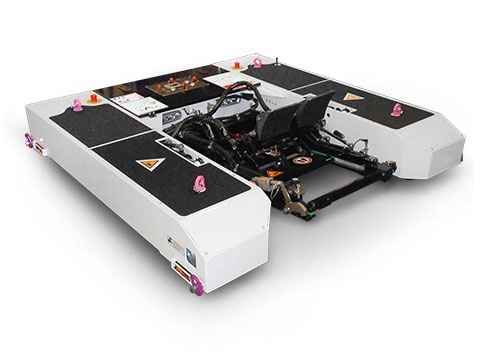 Safe transportation with a maximum of circumferential visibility around the aircraft is granted by wireless transmission control and fully automatic guided steering, an integrated magnetic deceleration systems confidently secures the machine when used on slanted ground. The TWIN-Series and M-Series are based on a U-shaped construction with a hydraulic platform that lifts the nose wheel. Two electric drives provide propulsion and maneuverability. Two hydraulical wheel securing paddles hold the nose gear fixed in position and prevents a slipping off from the platform. 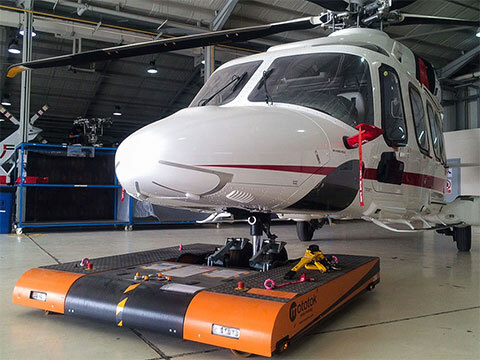 The loading and operating process of wheeled helicopter is carried out with the utmost security and precision. In addition, it runs fully automatically on many models such as the TWIN and the M528. The engaging procedure can be started automatically by pressing just one button on the remote control. 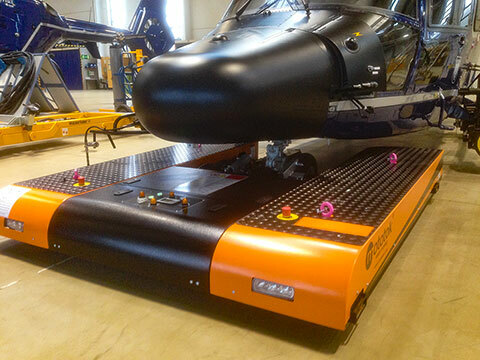 Drive the Mototok with opened hydraulical door and lowered platform towards the nose wheel of the aircraft until the nose wheel touches the sliding table. Then press the start-button on the remote control. The hydraulical door closes. If necessary the sliding table is adjustable for fitting smaller nose wheels. The sliding table presses the nose wheel towards the closed hydraulical door until a specified pressure is reached. The platform lifts up and raises the nose wheel. The securing paddles lowers down and clamps the nose wheel gently and safely – ready for moving the aircraft. The whole procedure takes 10-15 seconds only. Our strongest model to the TWIN Class – specially designed for operations on ships, offshore platforms and other extremely harsh conditions. Quartz sand tyres for ultimate grip available. The Mid-Class TWIN Model – our „Best-Seller“ for almost all demands. The M 528 is a fully equipped aircraft tug with automatic loading functions for a convenient and quick loading and releasing of the aircrafts nose gear. Safety nose wheel paddles for a safe and gentle clamping of the nose gear – prevents the nosewheel from rising and slipping out of position. 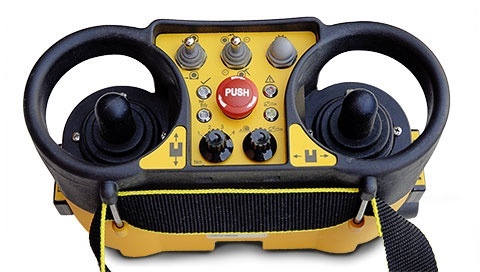 The securing device is hydraulically lowered onto the nosewheel and securely locked at the push of a button on the remote control. 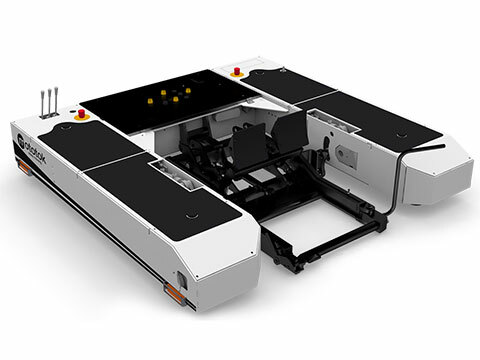 The M 515 comes with a manual hyraulic aircraft loading system. 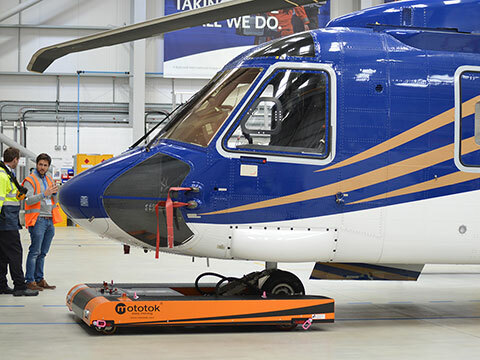 Use Helimo to move any type of helicopter with skids in a matter of seconds. 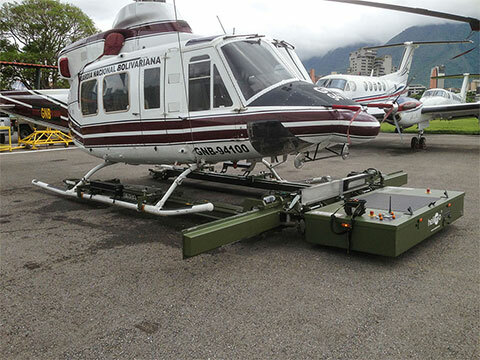 Regardless of cameras, radar, floats, winds or weapons mounted on belly or skids, 8 alternative methods to load your helicopter ensure swift movement for swift action. Compatible with tools like FLIR, searchlights, RADAR, antennas, etc.